Hyperthermia, a condition in which the body is unable to cool itself fast enough, can happen anytime of the year, even in winter. But as the summer months approach, the risk becomes even greater, especially for young children. To raise awareness about childhood hyperthermia, Safe Kids Worldwide and the General Motors Foundation have banned together and launched a national campaign, Never Leave Your Child Alone in a Car. To kick off the campaign, the organizations held a press conference in Boca Raton, FL, hoping to educate the public on just how dangerous leaving a child in a vehicle can be. After the conference, the Boca Raton Fire and Rescue Services provided a demonstration on how they respond to emergency calls concerning children left in vehicles and how they handle lock-ins. Tips for parents, caregivers and passerbys were also given at the conference. Temperatures inside of a vehicle can raise nearly 20 degrees in just 10 minutes. Leaving a window cracked or down has no effect on the rising heat. For children, the rising temperature can be lethal. Their bodies heat up three to five times faster than the average adult’s, resulting in hyperthermia. In a matter of minutes, the child’s condition can become severe or fatal. More than 500 children have died from hyperthermia since 1998 and the number of near deaths is substantially higher. More than half of all fatalities have occurred because the caregiver was distracted, resulting in accidentally leaving the child in the vehicle. 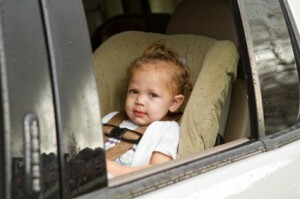 Thirty percent of all deaths were due to children playing in an empty, unattended vehicle and becoming trapped inside. Seventeen percent of those deaths were due to the child being left in the vehicle intentionally. Just so parents know, it is now considered a crime, punishable by law, in most stated to leave your child in a vehicle unattended, even for just a moment. The greatest risk, however, is completely unintentional; parents become distracted and forget that their child is with them. Miscommunication between caregivers and parents result in children left in vehicles; these situations happened regularly and we read about them each and every year. Tips provided by Safe Kids Worldwide and the GM Foundation can help parents and caregivers remember to take their child out of the vehicle before walking away. These tips can also ask that bystanders be an integral part in keeping children safe from hyperthermia. Together, we can cut down the number of deaths and near-misses by remembering to ACT. Dial 911 immediately and follow the instruction that emergency personnel provide – they are trained to determine if a child is in danger.